I have been blessed with wonderful business and personal partnerships. 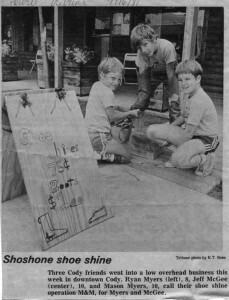 I think my first business partnership was a childhood business in Cody, Wyoming, with my brother and Jess McGee (I’m 44 in green) in the classic lemonade stand and the more entrepreneurial shoe shine business below. 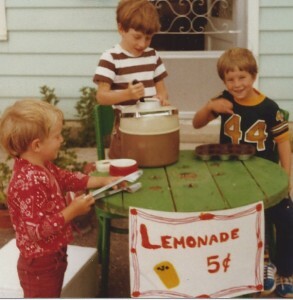 I formed a partnership with a college friend, Kevin Watters, and others to do an Internet start-up in 1994. We had a team of core partners at Student Advantage during our venture-capital raise and subsequent IPO in the late 1990’s. My high school friend and business partner, Tim Veitzer, and I have had a wonderful partnership since acquiring the National Holistic Institute in 2003 and managing it for 10 years — so far. At my investment fund, Greybull Stewardship, I enjoy tremendously my partnerships with the management teams at the companies in which we’ve invested — it is my favorite part of that endeavor. And, I have a wonderful set of partners who have provided capital to the Greybull Stewardship fund. I have yet to have a partnership turn sour — I hope it never happens. Sometimes one can learn more from failures than from successes, so maybe I have some important lessons yet to learn. Nonetheless, here are some thoughts that I think are good to think about as we all try and be great partners. Focus on alignment and communication up front. Making sure that goals and values are aligned up-front saves a lot of energy later. Always do more than your fair share. The best advice I ever got about being a partner is to try and do more than what you may think is your fair share. This is for a simple reason of information asymmetry: we always know more about what we are doing than what our partner is doing. If we aren’t careful, we can fall into the trap of thinking that we are doing more, simply because we are more aware of our work. Thus, I find it to be a healthy attitude to strive to do more than expected in each partnership and feel good about that. That is a great way to eliminate the worry that you are doing too much or aren’t getting a fair shake. Enjoy the work of investing in the partnership. Every relationship is work, and you want the work of investing in the partnership to be enjoyable — whatever that is for you. Communicate. Things can go sidewise easily as soon as we start assuming things or wondering about things. Communication helps all as we all know and understand better what is happening with the other person. Give each other space. Let each partner have some space, responsibility, and freedom. 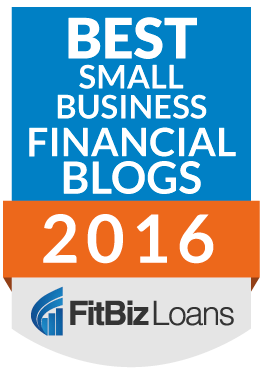 Partnerships can create tremendous efficiencies. Partnerships are so much work, it is important to get the benefit — efficiencies — and the leverage of having partners. Having a partner means that you should be able to divide and accomplish more. I like how some large companies often have co-CEO’s so that twice as many customers feel that they have a direct line to the CEO. Of course, some things require the brain power of all partners and it is more enjoyable to do it together. Have complementary skills when possible. Everyone always gives this advice and it is correct. I, however, have not been good at this in my endeavors. I think it is because I find myself being friends with people with similar interests. Complementary skills can be keys because they help leverage the partnership and they help each partner to have his or her own space. Have a way to make decisions. There is no right way to make decisions, but establishing a culture around decision-making is important. If you have to rely on the legal documents, you have already failed. Some partnerships defer to the partner that is most passionate (Ben Cohen and Jerry Greenfield of Ben & Jerry’s Ice Cream). Some people defer to the partner in their areas of expertise. Some partnerships want consensus for any major decision. There is no one perfect answer, but it is important to be on the same page about how your partnership will make decisions. There aren’t many things in business more important than partnerships. Many things worth doing require multiple people rowing in the same direction. Improving our skills on how to be a good partner could be the most important skills to all of our long-term success.